Seaside reflections are captured in moments of stillness. This video is part of a series produced during the 2018 CAFx Summer School. The theme was "Architecture as Social Integration". The CAFx Summer School, part of the Copenhagen Architecture Festival, brings together students from various countries in the pursuit of architectural exploration through film. The 2018 program was hosted in the small port town of Skagen, Denmark. This location may be viewed as a case study for the effects of migration to a place with a steadily declining population. This provided students with an opportunity to speak with residents and select locations characterized by evidence of social integration, defined by Program Director Susanne Eeg as "facilitating connections between people, making the building (and not the people) talk on camera". The quaint fishing port and former art colony rests comfortably at the northern point of Denmark, hidden from the world. Its history as a fishing town is most often celebrated during the seasonal tourist months, whereas the rest of the year is quite calm. Recently, younger workers from neighboring countries have been moving to Skagen in search of work. Curious students explored the interaction of the two groups through an architectural lens, hoping to portray their interpretations of Skagen's residents through film. One of these films is "Encounter", written by Bayan Mujahed; here two distinct characters emerge, people and the sea. This video follows the daily interactions of students attending a naval academy along the coast of Skagen. Mujahed's approach is clear: she presents a time-lapse of the naval facility, highlighting specific views that reveal nuanced interactions that might otherwise go unnoticed. At the beginning of the video, she briefly states the purpose of her film: to display "an encounter" between students, the sea and the space. 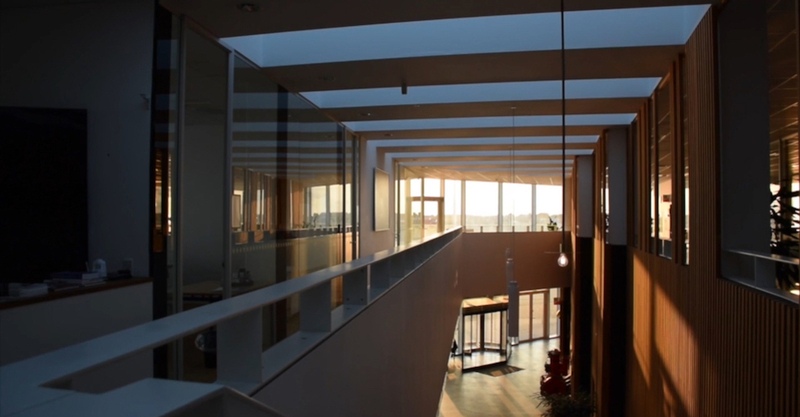 The subsequent frames showcase the exterior of the modern, ship-like facility, designed by AART architects in 2011. This 2500 square meter building features a sharp, pointed form extending toward the water, whereas the second level includes a balcony resembling a ship deck contrasted by a white paneled façade. The interior is light and open, due to generous glass surfaces and soft-wood paneled partitions within the atrium. An initial interpretation of the use of time-lapse could be to track user movements to better analyze how they use the space, although Mujahed goes much further in her presentation of the academy. One of the techniques she relies on is that of reflectivity. A significant number of the shots are set up to display multiple glass surfaces, allowing both a view into study rooms while simultaneously revealing the actions of those behind the camera through the glass. This suggests a duality of space, prompting viewers to consider not just what is directly visible, but what may be occurring outside the frame. Her concept is further strengthened by purposely maintaining a view of the water in every frame, thus reinforcing the connection between the people and the sea. Mujahed leaves us with a final shot of the sunset through the building atrium, contrasted by ships floating against the horizon, reminding us of the ever-present natural qualities of water and light that influence our interactions more than we realize, guided by the spatial filter of the naval facility.